Definition at line 269 of file llpanelavatar.h. Definition at line 375 of file llpanelavatar.h. Definition at line 1231 of file llpanelavatar.cpp. References LLUICtrlFactory::buildPanel(), createPanelAvatarClassified(), createPanelAvatarFirstLife(), createPanelAvatarInterests(), createPanelAvatarNotes(), createPanelAvatarPicks(), createPanelAvatarSecondLife(), createPanelAvatarWeb(), gUICtrlFactory, sAllPanels, and selectTab(). Definition at line 1303 of file llpanelavatar.cpp. Definition at line 1309 of file llpanelavatar.cpp. Definition at line 2369 of file llpanelavatar.cpp. Definition at line 2376 of file llpanelavatar.cpp. Definition at line 2354 of file llpanelavatar.cpp. Definition at line 2383 of file llpanelavatar.cpp. Definition at line 2362 of file llpanelavatar.cpp. Definition at line 2340 of file llpanelavatar.cpp. Definition at line 2347 of file llpanelavatar.cpp. Definition at line 2040 of file llpanelavatar.cpp. References LLPanel::childIsVisible(), LLPanel::childSetEnabled(), FALSE, mHaveProperties, and TRUE. Definition at line 2261 of file llpanelavatar.cpp. References _PREHASH_AgentID, _PREHASH_GodID, _PREHASH_GodKickUser, _PREHASH_GodSessionID, _PREHASH_Reason, _PREHASH_UserInfo, LLMessageSystem::addStringFast(), LLMessageSystem::addU32(), LLMessageSystem::addUUIDFast(), gAgent, LLAgent::getID(), LLAgent::getSessionID(), gMessageSystem, KICK_FLAGS_FREEZE, LLMessageSystem::newMessageFast(), LLMessageSystem::nextBlockFast(), and LLAgent::sendReliableMessage(). Definition at line 2233 of file llpanelavatar.cpp. References _PREHASH_AgentID, _PREHASH_GodID, _PREHASH_GodKickUser, _PREHASH_GodSessionID, _PREHASH_Reason, _PREHASH_UserInfo, LLMessageSystem::addStringFast(), LLMessageSystem::addU32(), LLMessageSystem::addUUIDFast(), gAgent, LLAgent::getID(), LLAgent::getSessionID(), gMessageSystem, KICK_FLAGS_DEFAULT, LLMessageSystem::newMessageFast(), LLMessageSystem::nextBlockFast(), and LLAgent::sendReliableMessage(). Definition at line 2289 of file llpanelavatar.cpp. References _PREHASH_AgentID, _PREHASH_GodID, _PREHASH_GodKickUser, _PREHASH_GodSessionID, _PREHASH_Reason, _PREHASH_UserInfo, LLMessageSystem::addStringFast(), LLMessageSystem::addU32(), LLMessageSystem::addUUIDFast(), gAgent, LLAgent::getID(), LLAgent::getSessionID(), gMessageSystem, KICK_FLAGS_UNFREEZE, LLMessageSystem::newMessageFast(), LLMessageSystem::nextBlockFast(), and LLAgent::sendReliableMessage(). Definition at line 290 of file llpanelavatar.h. Referenced by LLPanelAvatarFirstLife::postBuild(), LLPanelAvatarSecondLife::postBuild(), LLPanelAvatarPicks::processAvatarPicksReply(), LLPanelAvatarPicks::refresh(), LLPanelAvatarClassified::refresh(), and LLPanelAvatarTab::sendAvatarProfileRequestIfNeeded(). Definition at line 307 of file llpanelavatar.h. Definition at line 1614 of file llpanelavatar.cpp. References LLViewerUICtrlFactory::getNameEditorByName(), LLLineEditor::getText(), and LLPanelFriends::requestFriendshipDialog(). Definition at line 1711 of file llpanelavatar.cpp. Definition at line 2309 of file llpanelavatar.cpp. References LLViewerUICtrlFactory::getNameEditorByName(), LLLineEditor::getText(), i, LLWeb::loadURL(), and S32. Definition at line 2253 of file llpanelavatar.cpp. References LLViewerWindow::alertXmlEditText(), finishFreeze(), gViewerWindow, and NULL. Definition at line 1582 of file llpanelavatar.cpp. References LLIMMgr::addSession(), LLViewerUICtrlFactory::getNameEditorByName(), LLLineEditor::getText(), gIMMgr, IM_NOTHING_SPECIAL, LLIMMgr::setFloaterOpen(), and TRUE. Definition at line 2219 of file llpanelavatar.cpp. References LLViewerWindow::alertXmlEditText(), finishKick(), LLFloaterView::getNewFloaterPosition(), gFloaterView, gViewerWindow, left, NULL, S32, and top. Definition at line 1628 of file llpanelavatar.cpp. References LLMuteList::add(), LLMute::AGENT, LLViewerUICtrlFactory::getNameEditorByName(), LLLineEditor::getText(), gFloaterMute, gMuteListp, LLMuteList::isMuted(), LLFloaterMute::selectMute(), and LLFloaterMute::show(). Definition at line 1654 of file llpanelavatar.cpp. Definition at line 1671 of file llpanelavatar.cpp. References LLFloater::close(), LLTabContainerCommon::getCurrentPanel(), LLFloaterAvatarInfo::getInstance(), and LLUICtrlFactory::getTabContainerByName(). Definition at line 1663 of file llpanelavatar.cpp. Definition at line 1598 of file llpanelavatar.cpp. References LLViewerUICtrlFactory::getNameEditorByName(), LLLineEditor::getText(), gFloaterWorldMap, NULL, LLFloaterWorldMap::show(), and TRUE. Definition at line 2281 of file llpanelavatar.cpp. References LLViewerWindow::alertXmlEditText(), finishUnfreeze(), gViewerWindow, and NULL. Definition at line 1272 of file llpanelavatar.cpp. References LLPanel::childSetAction(), LLPanel::childSetEnabled(), LLPanel::childSetVisible(), FALSE, LLTabContainerCommon::getPanelByName(), LLUICtrlFactory::getTabContainerByName(), mTab, onClickCancel(), onClickCSR(), onClickFreeze(), onClickKick(), onClickOK(), onClickUnfreeze(), LLTabContainerCommon::removeTabPanel(), sAllowFirstLife, and TRUE. Definition at line 2176 of file llpanelavatar.cpp. References _PREHASH_AgentData, _PREHASH_AgentID, _PREHASH_TargetID, LLMessageSystem::getUUIDFast(), and sAllPanels. Definition at line 1958 of file llpanelavatar.cpp. References _PREHASH_AgentData, _PREHASH_AgentID, _PREHASH_AvatarID, _PREHASH_GroupData, _PREHASH_GroupID, _PREHASH_GroupInsigniaID, _PREHASH_GroupName, _PREHASH_GroupTitle, LLScrollListCtrl::addElement(), DB_GROUP_NAME_BUF_SIZE, DB_GROUP_TITLE_BUF_SIZE, LLScrollListCtrl::deleteSingleItem(), LLScrollListCtrl::getItemIndex(), LLMessageSystem::getNumberOfBlocksFast(), LLMessageSystem::getReceiveSize(), LLUICtrlFactory::getScrollListByName(), LLMessageSystem::getStringFast(), LLMessageSystem::getU64(), LLMessageSystem::getUUIDFast(), i, llendl, llinfos, LLUUID::notNull(), S32, sAllPanels, LLScrollListCtrl::sortByColumn(), and TRUE. Definition at line 1921 of file llpanelavatar.cpp. References _PREHASH_AgentData, _PREHASH_AgentID, _PREHASH_AvatarID, _PREHASH_PropertiesData, _PREHASH_SkillsMask, _PREHASH_SkillsText, _PREHASH_WantToMask, _PREHASH_WantToText, DB_USER_SKILLS_BUF_SIZE, DB_USER_WANT_TO_BUF_SIZE, LLMessageSystem::getString(), LLMessageSystem::getStringFast(), LLMessageSystem::getU32Fast(), LLMessageSystem::getUUIDFast(), and sAllPanels. Definition at line 2148 of file llpanelavatar.cpp. References DB_USER_NOTE_SIZE, LLMessageSystem::getString(), LLMessageSystem::getUUID(), and sAllPanels. Definition at line 2197 of file llpanelavatar.cpp. Definition at line 1776 of file llpanelavatar.cpp. References _PREHASH_AboutText, _PREHASH_AgentData, _PREHASH_AgentID, _PREHASH_AvatarID, _PREHASH_BornOn, _PREHASH_FLAboutText, _PREHASH_Flags, _PREHASH_FLImageID, _PREHASH_ImageID, _PREHASH_PartnerID, _PREHASH_PropertiesData, AVATAR_ALLOW_PUBLISH, AVATAR_IDENTIFIED, AVATAR_ONLINE, AVATAR_TRANSACTED, DB_BORN_BUF_SIZE, DB_USER_ABOUT_BUF_SIZE, DB_USER_FL_ABOUT_BUF_SIZE, DB_USER_PROFILE_URL_BUF_SIZE, FALSE, LLStringBase< char >::format(), LLMessageSystem::getBinaryData(), LLMessageSystem::getSize(), LLMessageSystem::getString(), LLMessageSystem::getStringFast(), LLUICtrlFactory::getTexturePickerByName(), LLMessageSystem::getU32Fast(), LLMessageSystem::getUUIDFast(), llclamp(), MAX_STRING, ONLINE_STATUS_NO, ONLINE_STATUS_YES, S32, sAllPanels, LLTextureCtrl::setImageAssetID(), and TRUE. Definition at line 1531 of file llpanelavatar.cpp. References LLScrollListCtrl::addElement(), LLDynamicArray< Type, BlockSize >::count(), count, LLScrollListCtrl::deleteAllItems(), gAgent, LLDynamicArray< Type, BlockSize >::get(), LLAgent::getID(), LLUICtrlFactory::getScrollListByName(), i, mAvatarID, LLAgent::mGroups, LLGroupData::mID, mPanelSecondLife, S32, LLScrollListCtrl::sortByColumn(), and TRUE. Definition at line 2124 of file llpanelavatar.cpp. Referenced by LLFloaterAvatarInfo::LLFloaterAvatarInfo(), LLFloaterDirectory::LLFloaterDirectory(), and LLPanelAvatar(). Definition at line 2132 of file llpanelavatar.cpp. References mTab, LLTabContainerCommon::selectFirstTab(), and LLTabContainerCommon::selectTabByName(). Definition at line 1745 of file llpanelavatar.cpp. References _PREHASH_SessionID, LLMessageSystem::addString(), LLMessageSystem::addUUID(), LLMessageSystem::addUUIDFast(), LLSD::asString(), LLPanel::childGetText(), LLPanel::childGetValue(), gAgent, LLAgent::getID(), LLAgent::getSessionID(), gMessageSystem, mAvatarID, mHaveNotes, mLastNotes, mPanelNotes, LLMessageSystem::newMessage(), LLMessageSystem::nextBlock(), and LLAgent::sendReliableMessage(). Definition at line 1732 of file llpanelavatar.cpp. References _PREHASH_AgentData, _PREHASH_AgentID, _PREHASH_AvatarID, _PREHASH_AvatarPropertiesRequest, _PREHASH_SessionID, LLMessageSystem::addUUIDFast(), gAgent, LLAgent::getID(), LLAgent::getSessionID(), gMessageSystem, lldebugs, llendl, mAvatarID, LLMessageSystem::newMessageFast(), LLMessageSystem::nextBlockFast(), and LLAgent::sendReliableMessage(). Definition at line 2052 of file llpanelavatar.cpp. References _PREHASH_AboutText, _PREHASH_AgentData, _PREHASH_AgentID, _PREHASH_AvatarPropertiesUpdate, _PREHASH_FLAboutText, _PREHASH_FLImageID, _PREHASH_ImageID, _PREHASH_PropertiesData, _PREHASH_SessionID, _PREHASH_SkillsMask, _PREHASH_SkillsText, _PREHASH_WantToMask, _PREHASH_WantToText, LLMessageSystem::addBOOL(), LLMessageSystem::addString(), LLMessageSystem::addStringFast(), LLMessageSystem::addU32Fast(), LLMessageSystem::addUUIDFast(), LLSD::asString(), LLPanel::childGetText(), LLPanel::childGetValue(), FALSE, gAgent, LLAgent::getID(), LLTextureCtrl::getImageAssetID(), LLAgent::getSessionID(), LLUICtrlFactory::getTexturePickerByName(), LLPanelAvatarAdvanced::getWantSkills(), gMessageSystem, llendl, llinfos, mPanelAdvanced, mPanelFirstLife, mPanelSecondLife, mPanelWeb, LLMessageSystem::newMessage(), LLMessageSystem::newMessageFast(), LLMessageSystem::nextBlockFast(), LLUUID::null, sAllowFirstLife, and LLAgent::sendReliableMessage(). Definition at line 1314 of file llpanelavatar.cpp. References LLViewerObject::getID(), LLViewerObject::getNVPair(), LLNameValue::getString(), ONLINE_STATUS_YES, and setAvatarID(). Definition at line 1375 of file llpanelavatar.cpp. References LLView::addChild(), LLPanel::childGetValue(), LLPanel::childSetEnabled(), LLPanel::childSetToolTip(), LLPanel::childSetVisible(), LLPanelAvatarNotes::clearControls(), LLPanelAvatarSecondLife::clearControls(), LLPanelAvatarClassified::deleteClassifiedPanels(), LLPanelAvatarPicks::deletePickPanels(), LLPanelAvatarFirstLife::enableControls(), LLPanelAvatarAdvanced::enableControls(), LLPanelAvatarWeb::enableControls(), LLPanelAvatarSecondLife::enableControls(), FALSE, gAgent, LLAvatarTracker::getBuddyInfo(), LLPanel::getChildByName(), LLAgent::getID(), LLViewerUICtrlFactory::getNameEditorByName(), LLView::getRect(), LLAvatarTracker::instance(), is_agent_friend(), is_agent_mappable(), LLAgent::isGodlike(), LLUUID::isNull(), mAllowEdit, mAvatarID, mDropTarget, mHaveNotes, mIsFriend, mLastNotes, mPanelAdvanced, mPanelClassified, mPanelFirstLife, mPanelNotes, mPanelPicks, mPanelSecondLife, mPanelWeb, NULL, ONLINE_STATUS_YES, sendAvatarPropertiesRequest(), LLPanelAvatarTab::setDataRequested(), LLNameEditor::setNameID(), setOnlineStatus(), LLLineEditor::setText(), and TRUE. Referenced by LLFloaterAvatarInfo::loadAsset(), setAvatar(), LLPanelDirBrowser::showDetailPanel(), LLFloaterAvatarInfo::showFromDirectory(), and LLFloaterAvatarInfo::showFromObject(). Definition at line 1336 of file llpanelavatar.cpp. References LLPanel::childGetValue(), LLPanel::childSetEnabled(), LLPanel::childSetToolTip(), LLPanel::childSetVisible(), FALSE, gAgent, LLAgent::getID(), LLAgent::inPrelude(), LLAvatarTracker::instance(), LLAgent::isGodlike(), mAvatarID, mIsFriend, mPanelSecondLife, ONLINE_STATUS_YES, and TRUE. Definition at line 373 of file llpanelavatar.h. Definition at line 364 of file llpanelavatar.h. Referenced by getAvatarID(), resetGroupList(), sendAvatarNotesUpdate(), sendAvatarPropertiesRequest(), setAvatarID(), and setOnlineStatus(). Definition at line 357 of file llpanelavatar.h. Definition at line 370 of file llpanelavatar.h. Referenced by sendAvatarNotesUpdate(), and setAvatarID(). Definition at line 366 of file llpanelavatar.h. Referenced by enableOKIfReady(), and haveData(). Definition at line 367 of file llpanelavatar.h. Definition at line 365 of file llpanelavatar.h. Referenced by setAvatarID(), and setOnlineStatus(). Definition at line 371 of file llpanelavatar.h. Definition at line 350 of file llpanelavatar.h. Referenced by sendAvatarPropertiesUpdate(), and setAvatarID(). Definition at line 351 of file llpanelavatar.h. Referenced by canClose(), and setAvatarID(). Definition at line 354 of file llpanelavatar.h. Definition at line 353 of file llpanelavatar.h. Definition at line 352 of file llpanelavatar.h. Definition at line 349 of file llpanelavatar.h. Referenced by resetGroupList(), sendAvatarPropertiesUpdate(), setAvatarID(), and setOnlineStatus(). Definition at line 355 of file llpanelavatar.h. Definition at line 372 of file llpanelavatar.h. Referenced by postBuild(), selectTab(), and selectTabByName(). Definition at line 361 of file llpanelavatar.h. 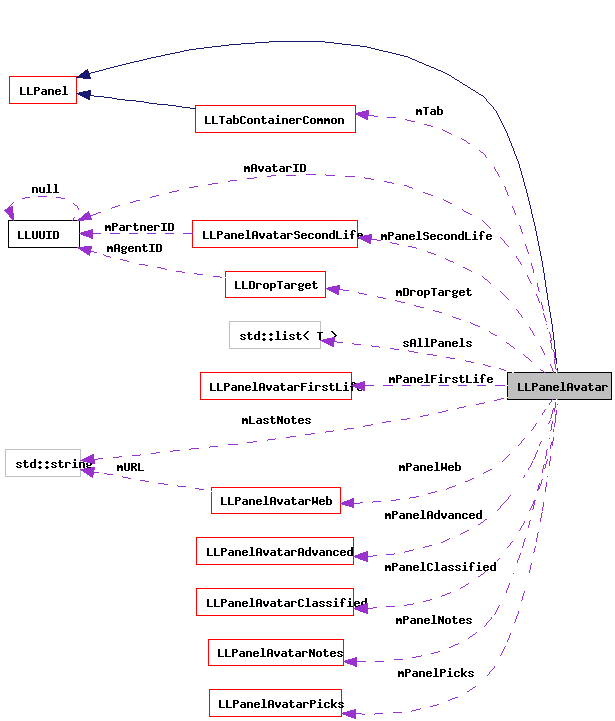 Referenced by idle_startup(), postBuild(), LLPanelAvatarAdvanced::postBuild(), LLPanelAvatarSecondLife::postBuild(), and sendAvatarPropertiesUpdate(). Definition at line 376 of file llpanelavatar.h. 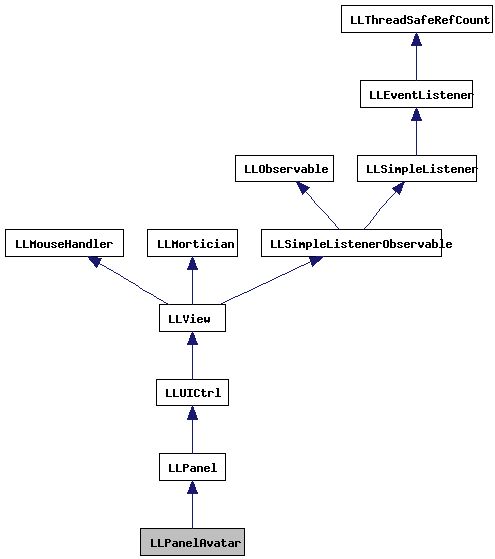 Referenced by LLPanelAvatar(), processAvatarClassifiedReply(), processAvatarGroupsReply(), processAvatarInterestsReply(), processAvatarNotesReply(), processAvatarPicksReply(), processAvatarPropertiesReply(), and ~LLPanelAvatar().